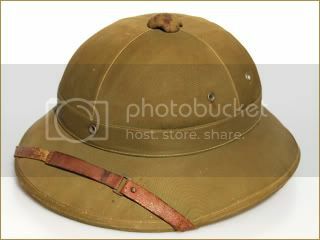 This is an early pattern Vietnamese sun helmet, and was likely made in the "inter-war" era between the First and Second Indochina Wars. 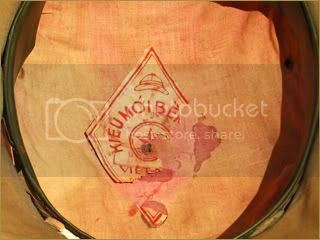 It is made of cork (unlike the later helmets), and has a label inside that indicates that it was made in Vietnam. 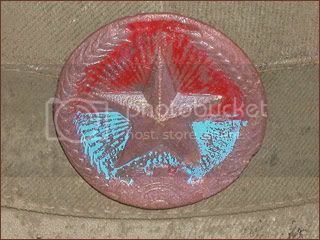 It also has the basic shape of the later North Vietnamese sun helmets, and this is likely based on the French M31 sun helmet. 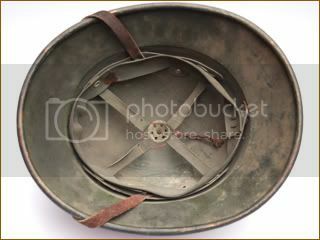 This is an early variation of the classic North Vietnamese Army sun helmet. It is made of a water proofed material, but is uncovered with cloth. There are the two standard vent holes to the side, but no front hole at the front. 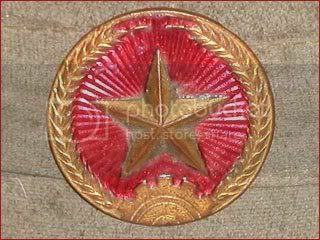 Instead a yellow star has been applied with a type of resin, possibly suggesting an officer used helmet. This helmet was reportedly obtained by Sgt. William D. Burnett (Alpha Company, 1st Bn., 18th Infantry Regiment, 2nd Bde, 1st Infantry Division) at the tail end of Operation Lexington in the Rung Sat Special Zone on May 22, 1966. 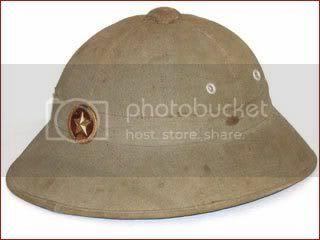 This wartime Vietnamese Pith Helmet features the VC badge. Used by the North Vietnamese and National Liberation Front forces during the Vietnamese War, this basic helmet design remains in service today. 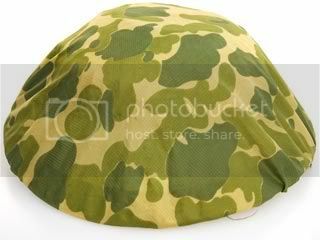 Made of a synthetic material with a cotton cloth layer bonded to the helmet the liner is rubberized cloth. 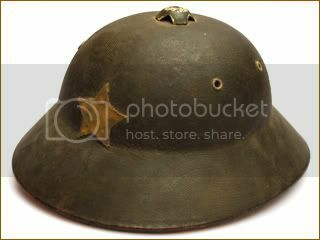 This wartime examples features a leather chin strap and has a steep dome and rim. This late wartime example has a more gradual slope to the helmet bowl and rim. 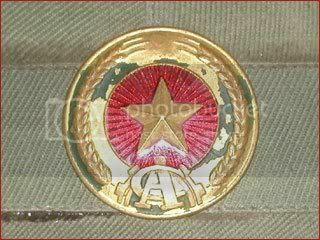 It features the traditional badge of the PAVN (People's Army of Vietnam), also known as the NVA. 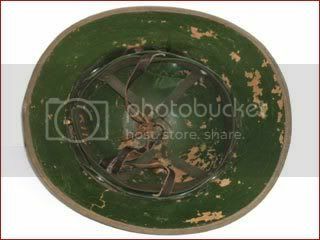 This post-war sun helmet is that used by the Vietnamese Army of the Socialist Republic since 1983. 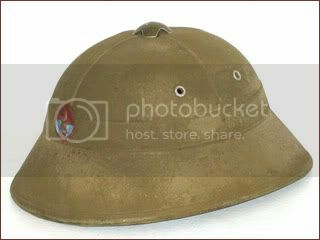 It is a modernized version of the wartime helmet. It features a plastic liner and chinstrap. 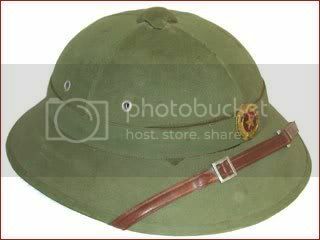 This helmet features the Vietnamese Cong An (Military Police) helmet badge. 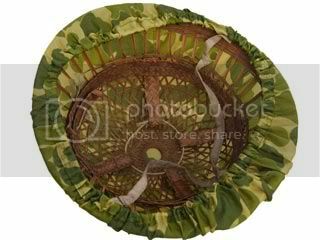 An unusual example of a field made "sun helmet" - this is nothing more than a wicker hat covered with U.S. camouflage.